Just as puppies grow considerably with each passing week, the most effective flea treatment for baby canines changes rapidly. Preventing fleas is the best way to keep them off very young puppies. Mother dogs should remain on flea preventives throughout their pregnancy. Some flea control products are safe for pregnant and lactating dogs, and your vet can advise you on which preventives to use. Once your puppy passes the 12-week mark, you can use most commercial flea preventives on him, but always consult your veterinarian beforehand. It's not safe to use commercial flea treatments on very young puppies. The best way to remove fleas from puppies in their first few weeks of life is via a gentle, daily flea combing. Replace the bedding in the whelping box and vacuum your house thoroughly, removing the contents of the vacuum cleaner bag. If a puppy is severely infested, take him to the vet for treatment. A flea infestation can prove fatal to puppies, as the parasites might deplete so much blood from your puppy that he becomes anemic. Puppies at least 4 weeks of age and weighing 2 pounds or more can receive Capstar <ahref="https: www.drugs.com="" pro="" capstar.html"=""> </ahref="https:>for flea removal. This active ingredient in this over-the-counter product, nitenpyram, works in just a half hour after the puppy consumes the medication. You can see fleas jumping off the puppy. Capstar kills adult fleas by paralyzing their nervous systems. 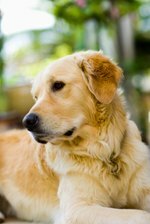 However, nitenpyram doesn't keep fleas off pets long-term — its effects only last about 48 hours. You can give puppies a daily tablet, but there's one important caveat. You must make sure your puppy weighs at least 2 pounds when receiving Capstar. That's not the case in many month-old canines. Undersized puppies might suffer from serious side effects, including neurological problems. Don't give Capstar to a puppy showing any signs of illness, even if he's in the correct weight and age range. Your vet might recommend a flea bath for puppies under the age of 6 weeks if the animal is heavily infested. Use only the product that your vet recommends, and use it only on your puppy. Some flea baths for puppies can be toxic to cats, and vice versa. Start by washing each puppy's neck, and be sure to get him wet down to the skin. Apply the shampoo around the puppy's neck, then thoroughly scrub his neck area. This method helps to prevent the fleas from traveling up to the puppy's eyes and ears, where it's more difficult to wash. Once you've washed the puppy's neck, you can proceed to wash the rest of his body. After using the appropriate flea shampoo in a warm water bath, thoroughly towel dry the puppy. If necessary, use a hair dryer — not on the hot setting — to dry him. It's vital that the puppy stay warm, as it's hard for him to regulate his body temperature and he easily could get sick. At the age of 6 weeks, puppies can start receiving the prescription topical flea preventive Revolution, containing selamectin. This once-a-month drug also prevents roundworms and hookworms in your pup, along with ear mites and ticks. It's also a heartworm preventive, but 6-week-old puppies are generally too young for heartworm exposure. If your puppy remains on Revolution as he grows, he should stay heartworm-negative. Your vet will give your puppy a blood test prior to prescribing Revolution and will require an annual blood test thereafter to ensure he's heartworm-free. Once a puppy reaches the age of 8 weeks, he can receive many commercial flea preventives, including over-the-counter and prescription medications. Frontline, containing (S)-methoprene and fipronil and available in topical or spray form, can be used on puppies of this age. It also controls ticks. The spray form can be used on puppies younger than 8 weeks, but check with your veterinarian before using it on a younger animal.